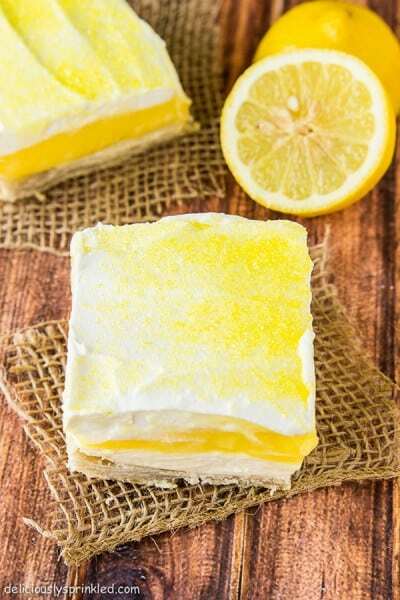 No-Bake Lemon Pie– this light and creamy lemon pie is full of flavor and makes the perfect spring or summer dessert! Hi, everyone! It’s Jennifer back from Deliciously Sprinkled. 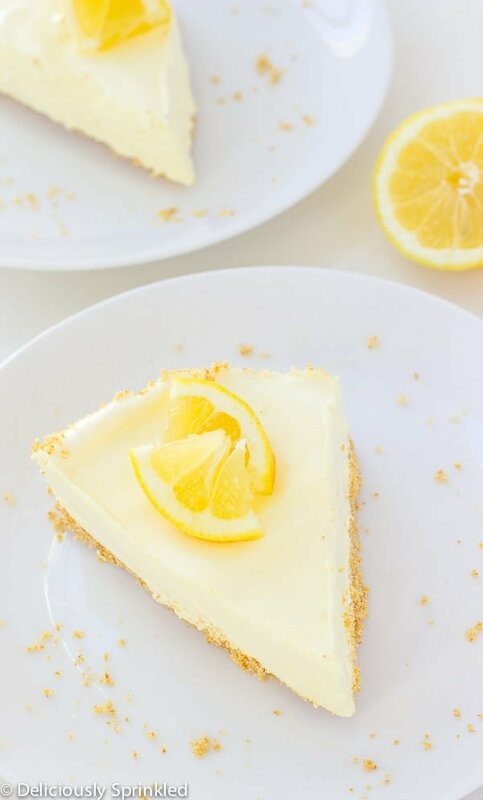 I’m so excited to share this No-Bake Lemon Pie with you today because it’s one of my all-time favorite lemon desserts! 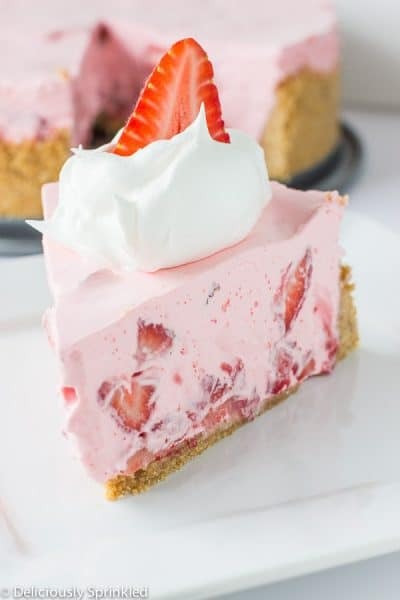 My family always requests that I make this No-bake Lemon Pie and my No-Bake Strawberry and Cream Pie for our families Easter brunch. 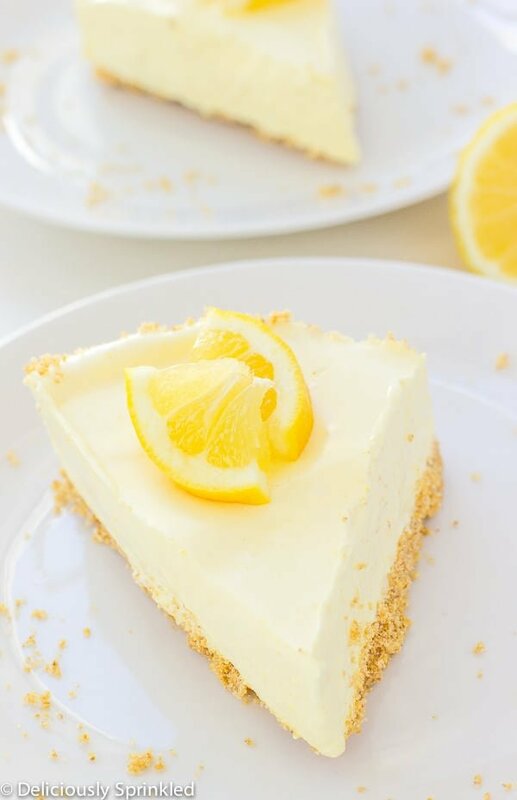 Not only is this No-Bake Lemon Pie so delicious and refreshing, it’s also one of the easiest pies to make because you don’t even have to turn on your oven. The hardest thing about making this pie is waiting for it to set in the refrigerator before being able to eat it. Using a food processor, pulse graham crackers until crumbly. Mix in sugar, ground cinnamon and melted butter until crust forms. 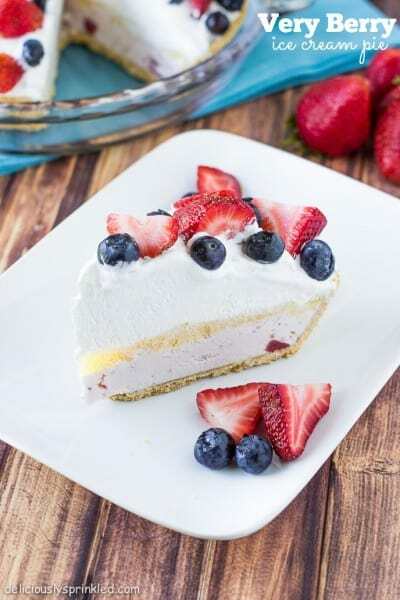 Press graham cracker crust into a 9-inch pie dish. Place pie crust in refrigerator. In a large bowl, add boiling water and gelatin powder. Stir gelatin powder until completely dissolved.Then, add ½ cup cold water and ½ cup ice cubes, stir until gelatin is slightly thickened. TIP: Let the gelatin mixture sit for a few minutes to thicken slightly before you add the cool whip otherwise it won’t set up. Add cool whip topping to gelatin mixture and whisk together until light and fluffy. Mix in lemon juice and lemon peel. Refrigerate for 30 minutes or until mixture has thickened. Add lemon pie filling to pie crust. Refrigerate for up to 6 hours or until firm. I love, love, love lemon. Did I tell you how much I like lemon?? It sounds perfect for an Easter dessert. I’m making my Italian Easter Bread with Colored Eggs and Pinza (another Italian Easter bread) The lemon pie sounds great. I’m pinning!! Happy St. Paddy’s Day! Hi Alys sa, how many ice cubes in 1/2 cup….about 4? Thanks.